Take 6 can be booked through this site. Take 6 entertainment booking site. Take 6 is available for public concerts and events. Take 6 can be booked for private events and Take 6 can be booked for corporate events and meetings through this Take 6 booking page. Unlike most middle agents that would mark up the performance or appearance fee for Take 6, we act as YOUR agent in securing Take 6 at the best possible price. We go over the rider for Take 6 and work directly with Take 6 or the responsible agent for Take 6 to secure the talent for your event. We become YOUR agent, representing YOU, the buyer. In fact, in most cases we can negotiate for the acquisition of Take 6 for international dates and newer promoters providing you meet professional requirements. Being patently original, with a timeless musical artistry can only define one group- Take 6. Take 3 parts Gospel + 1 part Jazz, +1 dash of Pop +1 touch of R&B = 6 parts of soulful harmony. Take 6's new album Feels Good ingeniously blends all these genres in a delicious, spirit-soaring feast of sound. With the release of their much-anticipated album Feels Good , Take 6 returns to their rich musical heritage bringing the listener along for one of their most uplifting, funky and inspirational joy rides to date. Feels Good makes you feel just that good. Its warm sonic tapestry weaves around the soles of your feet and up until it tickles the very baby hairs on your arms. Take 6 began crafting Feels Good a year and a half ago, yet this project represents everything that devout Take 6 fans, over the years, have come to love and expect from this multifaceted sextet. With a nod to their history, Feels Good boldly looks forward attacking Acapella in new exciting ways. With a staggering eighteen Grammy-Award nominations, Take 6 is the most nominated Gospel, Jazz, Pop or R&B artists in Grammy history. Yet along with their solid 10 Grammy wins, 10 Dove Awards, one Soul Train Award and two NAACP Image Award nominations already on their mantel, Take 6 have set yet another challenge for themselves. The group has recently launched Take 6 Records, and is now capitalizing on, not only their 20 years of collective experience in the creative side of music, but also, by taking a more proactive role, in the business of music. Member Alvin Chea says, This was a natural progression for us. Traditional record companies want to lock you into a particular category. If you are slightly askew of that, they really don't know what to do with you. We decided to take the reigns on this project and in our careers so we could position our projects in the marketplace by how we felt lead. In the music industry, Take 6 is so universally recognized as simply being the best , that they have virtually owned Downbeat magazine's readers' poll having won Favorite Jazz Vocal Group 9 consecutive years. In spite of this, Mark Kibble states, It is important for us to continually challenge ourselves musically in order to keep our music and creative spirit fresh. Take 6 has received some of its highest praise from the music industry's icons. Mega producer and longtime collaborator Quincy Jones, has described Take 6 as The baddest vocal cats on the planet. In their stellar career, they have been honored to perform with numerous music legends including Ella Fitzgerald, Miles Davis, David Foster, Al Jarreau, Stevie Wonder, Denyce Graves, The Yellowjackets and Wynton Marsalis among a host of others. The Take 6 style has also reached today's pop culture. Their musical style and tight harmonies have influenced pop groups from Boyz II Men and Backstreet Boys to *NSYNC. As wonderful as these honors and accolades are, Take 6 is still committed to using their music as a ministry. Claude McKnight (founding member) beams, I'm immensely proud of the fact we have had only one personnel change in the group which was founded 20 years ago. It is very much a testament to our commitment to one another and spreading the gospel through our music . 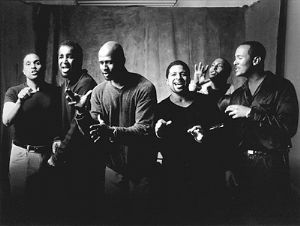 Take 6 consists of members: Alvin Chea, Cedric Dent, Claude McKnight, David Thomas, Joel Kibble and Mark Kibble. Book Take 6 for your next event! Would you like to have Take 6 perform at your next corporate event, party or concert? Simply fill out the simple interest form below, and we’ll start the booking process.